Note: These images are provided for color comparison purposes only; actual frame profiles may vary. Trim lines as shown on the mats may also vary. 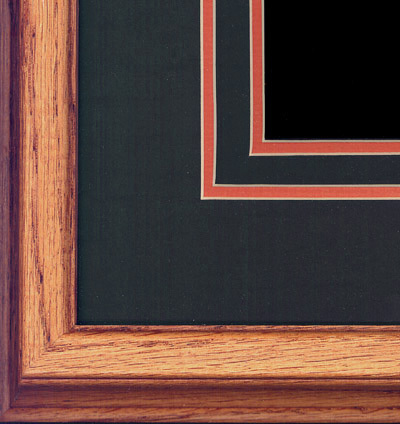 Feel free to call us about our current framing profiles and specific matting features in stock. Double-cut dark ash and burnt orange 3"
Double-cut dark olive and burnt orange 3"
Double-cut dark ash and gold 3"
Double-cut dark olive and gold 3"
Double-cut dark ash and blue 3"
Double-cut photo grey and biscay blue 3"